The embodiment may relate to physically interactive games or coordination enhancement tool for sports or geriatric applications using lightweight tangible projectiles. A tethered ball game embodiment may include a play ball and a tether that may be connected to the play ball and a sensor head assembly. The tether may be elastic. The sensor head assembly may have a force sensor to determine an impact power imparted to the play ball, a spin sensor to determine a rotational value of the play ball, a travel path sensor to determine a path of travel of the play ball, and a play ball strike sensor to determine a strike to the play ball. 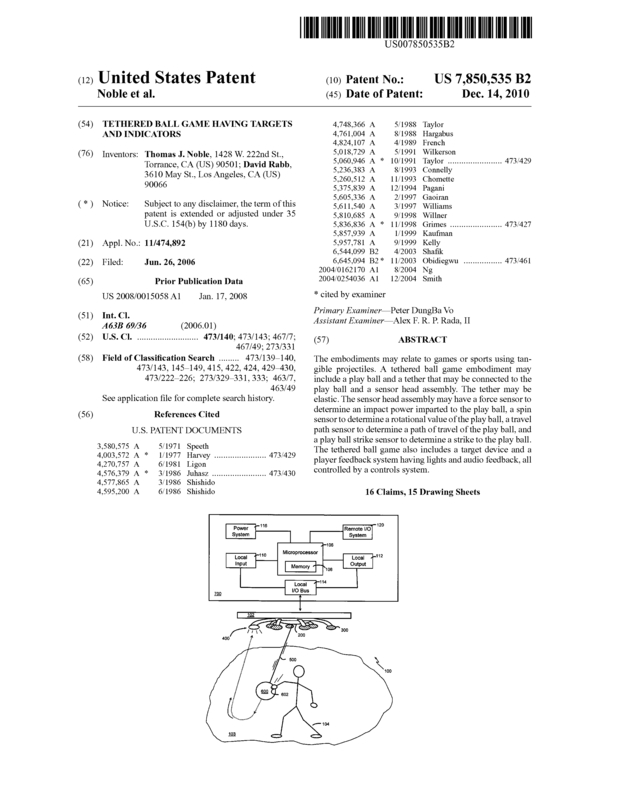 The tethered ball game also includes multiple targeting devices and a player feedback system having lights and audio feedback, all controlled by a controls system utilizing music to synchronize the active target selection. No part of this patent has ever been sold or marketed, however the market potential, backed by the (15) Patent Claims, is enormous. The versatile operation and modular design provides broad compatibility with all ages. Both an economical and high end version of this product have been fabricated for component and interactive operations validation. Open to appropriate opportunities which can leverage this IP to generate revenue immediately and possibly over time. Will consider a partnership to promote and market a version of this product. My major contribution would be my expertise in the system interactive operation, H/W and S/W engineering and a wide range of applications. Page created at 2019-04-25 14:11:24, Patent Auction Time.